How do we establish what level of river gravel extraction is sustainable? Welcome to Issue 2 of Catchment Connections. One of the central philosophies of ICM is knowledge and information sharing. Knowledge management (KM) provides a useful framework to look at how information and knowledge is shared within and from the ICM programme. Having flexible systems to support all of the above. As researchers, we are constantly seeking to address gaps in our understanding of how natural and human systems work. In the early days of the ICM research programme we reviewed the existing knowledge base to determine what our research focus would be. Results of that exercise led to the production of the ICM status report. An ICM approach, then, involves forming extensive social networks both within and external to the programme that enable us to quickly determine ‘who knows what’ or who to go to for additional information. Our research team and stakeholders are constantly informed about goings-on in the programme and we use the ‘Events’ section of our website and the ICM AGM as ways for doing this. Because we are all from different agencies and are in different physical locations it is not often practical to have face-to-face (f2f) meetings. We use our AGM as the primary tool to engage in f2f activities but we also have an online collaborative dialogue space, Confluens, within our website where we can interact and debate issues on a daily basis. Lastly, we use our website as the main system that supports the other four elements of our KM strategy. All our knowledge products or outputs from the research (e.g. publications, reports, presentations) are available through the ICM website (we are also one of only a few FRST-funded research programmes that make all our information available publicly). We also use this facility via Confluens to deal with day-to-day aspects of project management. In summary, the ICM Motueka research programme ‘walks its own talk’ when it comes to the principles of KM by creating an environment where the knowledge and information we are gathering are shared. This further supports a fundamental philosophy of ICM, and that is, without a shared understanding of the knowledge and information about a catchment or a problem it will be difficult to bring about change – be it on the ground or in relation to policy. In this issue of Catchment Connections we include an intriguing insight into what drives trout movement and where they go; a look at what happens when artists, scientists and the community get together; IDEAS – a modelling framework or just a place to hang your toys; the ‘social spaces’concept as a way of mapping interactions in an ICM project; the Sherry River community and their efforts to make their river swimmable; cows in and out of creeks and the difference it makes; whether we can afford to take gravel out of the river; and a look at using ICM to improve nutrient efficiency in the Waikato. Water quality and extraction limits that are set in rivers are typically site specific, but aim to protect the values present in entire catchments. Trout are a useful indicator of instream health, but they are highly mobile and will move around catchments to maximise growth and feeding/spawning opportunities. Management of water quality and flow requires an understanding of these movements so the characteristics of key habitats are protected at the right times of the year; there is no need for blanket protection if trout are only present seasonally. ICM research in the Motueka catchment has been improving our understanding of trout movement throughout catchments and how these movements are relevant to management initiatives. Trout were the focus of this study because the Motueka River supports some of the highest densities of brown trout in New Zealand and attracts anglers from around the globe. The importance of this fishery has been recognised by a National Water Conservation Order gazetted in 2004. Three strands of research have been used to investigate fish movement patterns: radiotracking of adult trout, trace element analysis of trout otoliths, and PIT tagging of juvenile trout. The radiotracking study showed that adult trout movements were closely related to flow and water temperature. Some fish moved substantial distances (>50 km) when flows were relatively high and temperatures relatively low, but as summer progressed movement was limited. In the smaller tributary streams, deep pools with good cover provided refuges for adult trout throughout the summer, and once residing in these pools the fish were reluctant (and possibly unable) to leave. A large (1-in-50 year) flood occurred during the study and had a marked effect on adult trout survival with about 65% of the tagged fish being killed by the flood. This study confirmed that substantial movements throughout catchments can occur, but also that adult trout will remain in relatively small streams during low-flow periods as long as there are sufficient refuges. Fish otoliths (earbones) grow throughout their lifetime and can be used to age fish in a similar way that trees are aged by counting their growth rings. The chemical composition of otoliths can be used to track fish movements by relating the composition of parts of the otolith to changes in the water/food chemistry of different locations where the fish has been living. This technique has been used successfully to distinguish between freshwater resident and sea-run fish, but the ability to detect relatively subtle differences among different freshwater environments relies on new technology. In conjunction with the ICM programme, Ricky Olley (a Masters student from the University of Otago) has found distinct differences in otolith chemical composition between juvenile trout collected from eight different tributaries of the Motueka River. He has also looked at the centre region of adult trout otoliths, which were formed when the fish were juveniles, and found that 60% of the adult fish caught in the mainstem of the river appear to have been recruited from the eight tributaries where chemical signatures had been determined. This information supports the need to provide special protection for particular tributaries that make a major contribution to the mainstem fishery and provides evidence of catchment-wide movements throughout a trout’s lifetime. This powerful technique has subsequently been applied in several other catchments throughout New Zealand where fish passage issues are a concern. The PIT (passive integrated transponder) tagging study of juvenile trout is still underway but is aiming to provide a better understanding of the contribution to the mainstem fishery of juvenile trout reared in tributaries. A long-term Cawthron study of juvenile trout abundance and growth in a tributary of the Motueka has shown that most yearling trout disappear during the winter. However, it is not clear if these ‘losses’ are related to migration downstream or to mortality. Future work aims to determine what proportions of juvenile fish are migrating downstream and when the main migration is occurring. 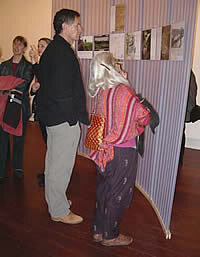 Visitors to the Travelling River exhibition. Weaving these strands together was at the core of a project that culminated in the exhibition Travelling River: a collaboration of artists, scientists and the people of the Motueka River catchment. Creating opportunities for dialogue builds awareness of and commitment for improved environmental management – the project aimed to build understanding about cultural and biophysical interconnections at a catchment scale. In 2002 Landcare Research hosted an art–science workshop to explore unusual, creative, ‘left field’ ideas that might emerge by bringing the two disciplines together. An art–sci proposal entitled Mountains-to-the-Sea arose from this forum and went on to be chosen as one of three NZ pilot art–sci projects funded by the MoRST/Creative NZ Smash Palace fund. The exhibition concept and brief was generated by the seven Mountains-to-the-sea team members: artists, biophysical scientists and social scientists. So why do this? Shaping forces are always at work – whether in a river catchment where we live, or our global village. Thinking of new ways of linking community and science in conversation to enhance our understanding and improve resource management is a fundament of ICM. Art can be a catalyst in providing new, exciting platforms for us to engage, reflect, challenge and potentially extend our worldviews. Travelling River is a participatory model that creates an ‘aesthetic connectivity’. In our case, this was between people of the Motueka Valley and River, those involved with the science of the place through the ICM research programme, and new audiences viewing this convergence through an art gallery or museum space. Science is often seen as being done behind closed doors. However, as was demonstrated, people enjoyed knowing more about what science was finding out about their place and the people who were doing it. Travelling River gathered together over 250 community and science images and associated stories in an exhibition at The Suter Te Aratoi o Whakatu Art Gallery in 2004. Later that same year it was installed at the Motueka Museum, and in 2005 at the Tapawera Show. Extracts from the poem ‘Motueka Song’ by local poet Cliff Fell were used as an ordering device for selecting images – poetic metaphor as a way of sorting images engaged and moved people greatly, e.g. More than 3000 people attended the exhibitions; many lively conversations were sparked between viewers as they wandered amongst the 24 braided-river-like curvilinear screens from which the images and stories were suspended. This model linking biophysical and cultural phenomena aesthetically could be applied to any catchment or broad-scale collective view. There has been considerable interest over subsequent years with the perceived success of the project – twice in 2005 the story was presented at international academic fora. Three nested publications arose from this work: Travelling River – exhibition catalogue (M Atkinson, S Peacock & A Fenemor), Conversations about a River – extracts from the first phase of the arts and science collaboration (S Peacock ed. ), and Mountains-to-the-Sea: reflections on the arts and science collaboration (M Kilvington & C Horn). Researchers have traditionally measured and modelled environmental impacts of land uses at plot scale. But what can we say about the impacts from a range of land uses at catchment scale, on (for example) water quality, sediment yield or coastal productivity? And what about the economic and social costs of those effects? The Integrated Dynamic Environmental Assessment System (IDEAS) is a modelling framework for testing futures scenarios at catchment scales. The concept is to combine a triple-bottom-line approach and a collaborative learning development process to help assess cumulative effects in land and water management. 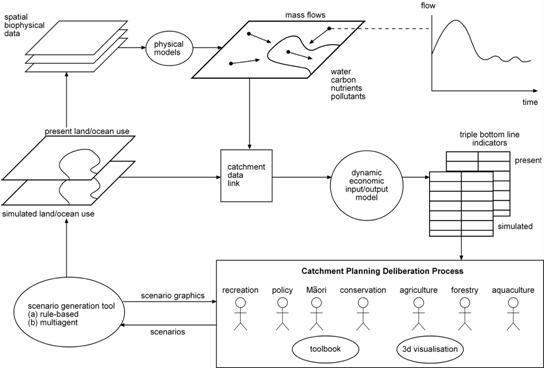 IDEAS provides a more quantitative lens on catchment futures than the ‘influence matrix’ method described in the January 2008 Catchment Connections. A challenge in the development of tools for ICM is ensuring they are fully utilised by stakeholders beyond the development phase. To meet this challenge IDEAS has both a social and technical stream of work associated with development. The technical stream of IDEAS is a loosely linked set of biophysical and socio-economic models that may be applied at a range of scales, from local through to regional. However, it has particular strength at the catchment scale where biophysical processes have strong spatial interactions. For example, in the Motueka catchment, there is strong interaction between nutrient export from agriculture and aquacultural productivity in Tasman Bay. The social stream uses a participatory approach to ensure stakeholder knowledge is incorporated into the models, to set parameter thresholds and design scenarios, and to ensure users understand the inherent assumptions within the models used. Involving stakeholders creates a shared understanding of model operation and its limitations. The technical and social aspects together are called IDEAS. Integration of biophysical with socio-economic models is difficult to achieve in a dynamic sense because biophysical models at the catchment scale tend to be complex, requiring much input data and computer processing. Economic input-output tables have historically incorporated national or regional environmental outcomes through the use of biophysical coefficients. These coefficients represent flows of mass and energy through the economy by sector. However, at the catchment scale, the coefficients depend strongly on the spatial arrangement of land use or offshore coastal uses. For example, the total export of nitrogen from a dairy or sheep farm depends strongly on spatial factors like the proximity of stock to waterways, and the particular soil characteristics. IDEAS enables the dynamic use of biophysical coefficients in socio-economic models using a lookup table relating biophysical coefficients to an appropriate land use combination. From the lookup table, the socio-economic models access the appropriate coefficients according to the catchment communities’ preferred land-use scenario. The socio-economic models comprise aspatial and spatial components. The aspatial component is called the Catchment Futures Model and is an economic input-output model coupled with a population growth model. The spatial component is an agent-based model that models how policy settings and environmental and economic outcomes influence individual land use and management decisions. It is used as a land-use scenario generator; allowing evaluation of policy and landowner values on possible catchment futures. So far, both an IDEAS stakeholder group and the ICM Community Reference Group have identified and prioritised the types of issues they see for the catchment in future, and these form the basis for six Motueka catchment scenarios. These are: (1) prehuman, (2) present land use, (3) present land use with best management practice, (4) very intensive agriculture, (5) very intensive agriculture with best management practice, and (6) continued present growth until 2020. IDEAS is then applied to assess and compare the environmental and socio-economic impacts of the scenarios. Such Integration of environmental and socio-economic factors facilitates learning by stakeholders of the impact of their personal visions on other stakeholders. While the socio-economic measures for scenario (4) may be satisfactory (see figure), the environmental measures indicate problems with high nitrogen concentration in river water and lack of water for irrigation. And while increased nitrogen runoff creates more production from river plume mussel farms, the accompanying bacterial and sediment loads may restrict harvesting, reduce scallop production and encourage nuisance species. IDEAS does not provide a framework for conflict resolution, but is a tool for helping people to understand the complex responses within a catchment system. Potential applications include council LTCCP processes, and interactive scenario testing as an environmental education tool. Integrated catchment management is fundamentally about new partnerships and ways of working across organisational and disciplinary boundaries. To help chart a way through these questions in ICM, ‘Social Spaces’ was developed as a framework to enable the programme participants to more clearly understand the different social spheres which exist within a complex programme operating over a number of years. The collaboration in the ICM research programme operates at multiple levels: between researchers, between institutions, and, critically, between the potential end-users of science and the science providers. Scientists in integrated research programmes often find themselves perplexed by the very notion of integration: with whom, when, and where should they be concentrating their efforts to enhance dialogue and collective learning? This is understandable as structural and institutional barriers (often the easiest to identify) and pejorative value judgements (much harder to observe) come in to play. In the Social Spaces framework we identify four spaces of engagement in the ICM programme (see figure), each characterised by specific norms of engagement, core relationships and particular intentions. This mapping approach is equally applicable to any ICM initiative, and helpful for understanding how myriad roles interact. The first three social spaces occur as the ICM programme interacts with researchers, managers and the community of the Motueka catchment. Number 1 is the central research collaboration space, where researchers from different disciplines and institutions interact; Number 2 is the space where research meets real-world problems – here termed ‘the learning space’, and is where facilitation and dialogue are used to bring together different perspectives and knowledge on catchment management issues; Number 3 is termed the information-exchange space, and is where the programme intersects with the wider community and shares information with end-users. Space Number 4 intersects with all the other three spaces and represents the interactions between the ICM programme and the wider national and international catchment research and management community. In the ICM Programme these four spaces all have two-way communication and collaboration links, although the strength of these varies with the character of the space and the nature of the communication activity that takes place in this space. It is the relative strengths of these links that help define the social space. Each of the four social spaces already has numerous activities underway to promote better relations between participants in the space and improved information development. Examples of these activities include: Travelling River; The Community Reference Group (CRG); the sediment learning group; Confluens internet network; the annual general meetings, Watershed Talk, and more. The Social Spaces framework was used at the 2006 AGM for future planning. A report on Social Spaces and the activities underway in the ICM programme is available on the ICM website. Water quality sampling throughout the Motueka Catchment in 2000–2001, led by Roger Young of Cawthron Institute, identified the Sherry River as a ‘hot spot’ of relatively high faecal contamination – as indicated by the faecal indicator bacterium Escherichia coli at concentrations well above guidelines for swimming (Young et al. 2005). This contamination was (plausibly) attributed to dairying in the Sherry Valley, particularly the frequent dairy herd crossings needed to move cows between paddocks and milking sheds on different sides of the channel. A special study of the water quality impact of a dairy herd crossing of the Sherry River (one of the first ‘integrated’ inter-agency studies within the Motueka ICM programme) was carried out in October 2002. This experiment showed that large amounts of contaminants are mobilised by dairy cows while crossing streams (Davies-Colley et al. 2004). As well as depositing manure and urine (containing a range of contaminants including nitrogen, phosphorus, E. coli and, potentially, pathogenic microbes) directly into the water, cows disturb stream bottom sediments causing release of fine sediment (causing water cloudiness or ‘turbidity’). The work suggested that bridging of raceways to keep cows out of stream water should have major water quality benefits. All four dairy farms in the Sherry Valley have since constructed bridges to retire crossings on raceways intersecting the river, with the fourth and final dairy bridge commissioned in October 2006. NIWA has been monitoring water quality (E. coli and turbidity; measured at four sites) in the Sherry River with ICM programme funding since May 2003. The graph compares bacterial water quality since complete bridging (E. coli annual medians, November 2006 to October 2007 inclusive) with original conditions. Clearly, water quality has been markedly improved by bridging, with a halving of faecal contamination at the Matariki monitoring site. However, a guideline for contact recreation (median of 126 E. coli per 100 mL; ANZECC 2000) is still exceeded in the dairy-farming reach of the Sherry River (Granity to Blue Rock), most likely reflecting continuing access of dairy cattle and other livestock to unfenced streams and drains, together with wash-in of faecal matter from riparian areas (stream banks) during rainstorms in the catchment. Monitoring of Sherry water quality continues with recent (since November 2007) extension to include continuous water flow monitoring, summer monitoring of dissolved oxygen and temperature, and measurement of visual water clarity, coloured dissolved organic matter and nutrients (forms of nitrogen and phosphorus) in the water. And since December 2007 Tasman District Council (Trevor James) have been monitoring water quality of tributary streams in the catchment. We expect to document further water quality improvements following implementation of best management practices by landowners in the catchment, co-ordinated by NZ Landcare Trust’s Barbara Stuart. ANZEEC 2000. Australian and New Zealand guidelines for fresh and marine water quality. Australia and New Zealand Environment and Conservation Council and Agriculture and Resource Management Council of Australia and New Zealand (ANZECC and ARMCANZ). Davies-Colley RJ, Nagels JW, Smith R, Young R, Phillips C 2004. Water quality impacts of a dairy cow herd crossing a stream. New Zealand Journal of Marine and Freshwater Research 38: 569–576. Young RG, Quarterman AJ, Eyles RF, Smith RA, Bowden WB 2005. Water quality and thermal patterns of the Motueka River: influences of land cover, geology and position in the catchment. New Zealand Journal of Marine and Freshwater Research 39: 803–825. One outcome of the collaborative water quality monitoring project described in the previous article has been the community cohesion created through working together on a catchment issue. This has led to the Sherry River Catchment Group taking a whole-catchment approach to further improve water quality through collaboratively developed landowner environmental plans. The Sherry River is a 7800-ha catchment made up of forestry in the upper end of the valley with a mix of dairy, sheep, beef and lifestyle landowners. The valley is a micro example of the larger Motueka catchment land use and has been a major contributor of E. coli and nutrients to the Motueka River. Sherry farmers accepted and acted upon the water quality results from ICM dairy crossing research because they had asked the question, and were therefore an integral part of the research. 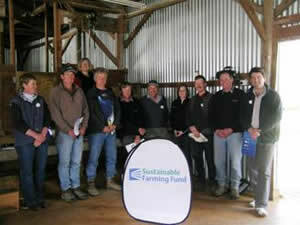 Now the catchment group has obtained support from the Sustainable Farming Fund through the NZ Landcare Trust because monitoring indicates that further changes in farm management will be needed to routinely meet their target of swimming water quality in the Sherry River. Turning that around will likely require bridging, culverting, riparian management and improved environmental planning involving all land-use types. At the kick-off workshop held in October 2007, a Landowner Environmental Planning (LEP) Process (see figure) and compilation of generic Best Management Practices for improving water quality for the catchment land uses were discussed. This was also an opportunity for dialogue between farmers, upstream forestry managers and the council’s river supervisor about sediment sources and willow maintenance. Landowners requested water quality monitoring of tributary streams to better identify where contamination is coming from. 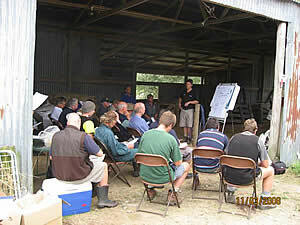 Tasman District Council (Trevor James) sampling has already helped focus attention on three tributaries. The major part of the project involves each landowner developing their LEP with help from consultant Andrew Burton, currently in progress. To effectively regulate and monitor gravel excavation and its impacts information is needed on trends in gravel supply, river bed levels, and excavation rate data through time. These data can be used to set and adjust extraction levels according to gravel supply. 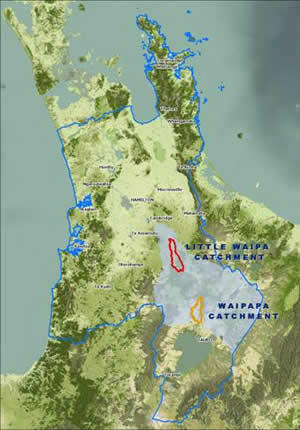 Many councils take advantage of natural accumulation zones to harvest gravel that is not being transported to the coast (e.g., on the Waimakariri and Wairau rivers) and aim to manage bed levels within prescribed limits. However, in Tasman District most rivers do not have large natural deposition zones and the proportion of gravel supply that can be sustainably harvested without having significant in-stream and downstream effects needs to be established. Periodic river cross-section surveys are the primary tool used by most regional councils to monitor river bed levels and to help set gravel extraction limits. Most river cross section survey networks were established for flood control management rather than being designed to manage gravel extraction and their validity has been questioned. Their spacing and survey frequency may not be ideal for managing gravel extraction. While river cross-section surveys provide direct data on trends in mean bed levels, they have limitations for calculating gravel transport rates and typically only give a minimum estimate of the gravel transport rate, particularly when derived from relatively infrequent cross section surveys. Many councils have moved to a two-tiered approach, with programmes of regular surveys (every 4–5 years) supplemented by surveys after significant flood events when most gravel transport occurs. An alternative to regular cross-section surveys to better establish gravel flux are short-term investigations involving a combination of field measurement and modelling of gravel transport. Presently digital photogrammetry or GPS are the most cost-effective options for obtaining such data. There is a clear need to consider LIDAR in the future as the cost decreases and combined terrestrial and bathymetric LIDAR becomes available. In the Motueka River case study, gravel extraction reached a peak in the 1970s and 80s when up to 200,000 m3/yr was taken from the river for roading and construction aggregate, and to improve the flood carrying capacity of the river (Fig. 1). Following the realisation that this level of gravel extraction was causing rived bed levels to decline (Fig. 2) and could undermine of structures such as bridges, cause channel and bank instability, and reduce groundwater levels, the TDC has significantly reduced the level of gravel extraction. However, setting gravel extraction limits remains a contentious issue. Current work in the Motueka River is using annual GPS surveys to better define gravel volume changes and assess how well the present river cross section network reflects bed level and gravel volume changes (Fig. 3). It clearly shows that the cross sections under-estimate the changes in gravel volumes stored in the river bed, but confirms the overall degradation trend. This type of investigation can establish an average sustainable gravel supply that could be adjusted following large flood events. The data on gravel supply needs to be supported by information on gravel extraction amounts and patterns, and more rigorous analysis of the integrated effects of gravel extraction on bed and bank stability, groundwater levels and in-stream habitat. Only then can allowable gravel extraction volumes be based on sound scientific understanding of gravel supply and the impacts of over-extraction. To provide information to the policy review process upstream of Karapiro (yet to occur). To date five community workshops and field days have been held, 12 property visits have been completed and six farm plans have been written. The focus for the upcoming year is to create up to 50 farm plans in the two catchments to gain a robust picture of issues within the catchment. As farm plans are completed, these will add to the knowledge and understanding within these catchments and assist in the development of future management strategies. The information will also contribute to the development of a catchment management plan. 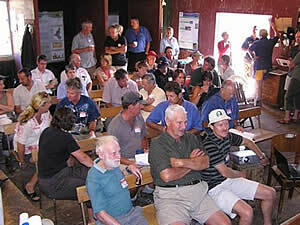 In November 2007 EW engaged AgResearch to critique plans and to provide input to the nutrient management sections. This has now included financial modelling using UDDER software to outline costs/benefits of current nutrient management best-practice options, and field days have been held to communicate these. Social research and evaluation of EW’s interaction with the community is also going on alongside the project to assist with evaluating the worth of ICM techniques vs other policy tools. The findings of all of this work will be brought together and used to contribute to future reviews of the Regional Policy Statement and the Regional Plan.